The Data Section of a Look is “just” the record set returned by the query and “just” the raw data used to construct a visualization. But don’t sell the Data Section short. Not only is there a wealth of data in this section, but there are some interesting things you can do with that data. 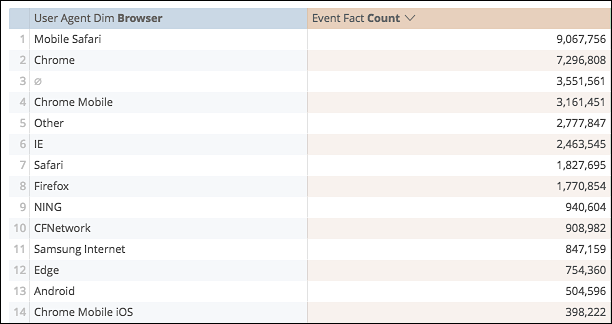 When you create a table visualization, you can define the field (or fields) that data sorts on; if you don’t explicitly define a sort order then, by default, Customer Insights will sort your table on the first column in the table, in ascending order (A to Z). This sort order determines the initial appearance of the table. However, when viewing a table you can re-sort the data pretty much any way you want. As you can see, any time you sort on a new column that data is sorted in descending (Z to A) order; that explains the downward-pointing arrow in the Country column). If you’d rather see the data sorted in ascending order, just click the Country column a second time. Click the Country column to sort by country. If you want to sort in ascending order, click Country a second time. Hold down the Shift key and then click City. To sort by city in ascending order, hold down the Shift key and click City a second time. Like we said, pretty cool. The only thing to keep in mind is that you need to hold down the Shift key for this to work. If you click a column header without holding down the Shift key you’ll sort solely on that column, and any other sorting options you might have set will disappear. That puts the Look back to the way you found it. Just note that it will also remove any filters you’ve applied to the table. 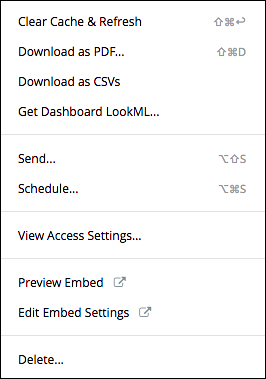 That will reload the Dashboard data and, along the way, reload the Dashboard itself. If the visualization you’re working with uses a pivot, you can place a similar limit on the number of columns displayed in the table.